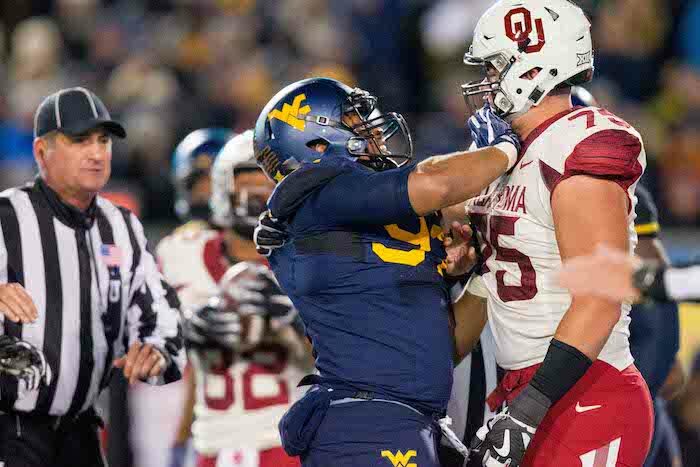 Big 12 Football Mailbag: Can West Virginia Challenge Oklahoma This Fall? It’s that time of year where football is scarce across Big 12 country. If you’re like me, you need a football fix and quick. This mailbag is for all you football junkies out there who root for a Big 12 school who not only have questions about your team, but other teams in the conference as well. So, join me, grab a cold brew and relax as I answer all your Big 12 questions in my mailbag. For those interested, I will send out a tweet (@Derekduke25) every Monday at noon until last call (No, not 2 AM) at 8 PM CT for you to send in your questions to be answered every Tuesday right here at Heartland College Sports. Starting next week, I will pick the best question for each mailbag and label it as my question of the week. The winner gets a free HCS Koozie to keep your beer cold (Unless you like it warm, but that’s just plain wrong). It was a DEAD Monday question wise compared to the previous weeks, but the show must go on. Unlike the “Big 12 blog” over at ESPN (I say that loosely because one story a week is a tragedy), we here at HCS are determined to give you the best Big 12 coverage on the planet. I want to thank each one of you who submitted a question this week and for those reading, I am glad you could join me. Let’s get this party started! 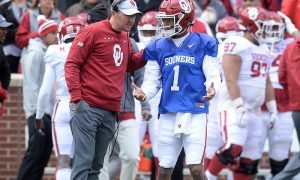 @jeffstraight76 asks: Do you think WVU has enough weapons to challenge OU for the Big 12 crown this year? 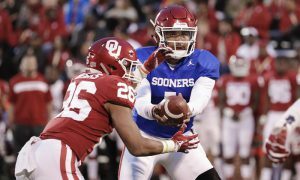 Duke: Jeff sent this tweet after I wrote an article about the best /worst case scenarios for the 2018 Oklahoma Sooners this past Saturday, so I went ahead and threw it in this week’s mailbag. I have said many of times, Will Grier is the best quarterback in the Big 12 without a doubt. If you have a quarterback in this league, you always have a chance. Not only does WVU have a great quarterback, they have an excellent wide receiver group with David Sills leading the way. One guy they will miss on offense is RB Justin Crawford but RB Kennedy McKoy should fit nicely in the offense as a more versatile back. The only thing making me back off WVU a bit is that defense. It was AWFUL last season against the run giving up over 200 yards per game on the ground. The defensive front was a big issue last season, the size, the depth, you name it. I do think the secondary will be fine but until those guys up front can stop the run; the rest won’t matter. The good news is that the Mountaineers added two defensive line grad transfers in Jabril Robinson (Clemson) and Kenny Bigelow (USC). Will they have enough depth this season? Not sure but IF this defense becomes respectable, the Mountaineers are more than capable of finding themselves in the Big 12 title game come December. 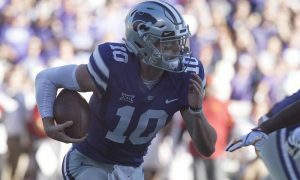 @StrawnBob asks: More undervalued Trump or K-State? Duke: I am not a political guy by any means. Bob, I know you are always reading and we greatly appreciate your support, but I am not here to talk about politics. However, the word undervalued, and Kansas State go hand in hand. Every single year folks in the media and other fan bases sleep on K-State a lot. With that being said, I had the Wildcats finishing third last season and that one came back and bit me like mosquito in the Texas heat. If anything, they under achieved last season. As far as this season goes, I have them finishing fifth or six which may be low but let’s face it, the Big 12 is WIDE OPEN this year. Could they finish second or third this season? It’s possible but I don’t think I could put them higher than fourth this season. The floor for thdis team is probably 6-6 put their ceiling is somewhere around 8-4 or 9-3. If I had to guess, 7-5 would be it and that’s exactly where Vegas likes them too. I will say this, nobody does more with less than Bill Snyder. He is the purple wizard and one of the greatest college football coaches of all time. It will be a sad day when he finally calls it quits. 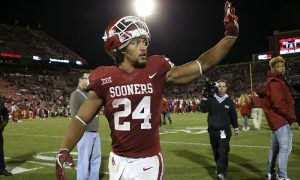 @thelonghorns12 asks: Who is a Big 12 Heisman dark horse? Duke: I’ll start of by saying this. In the last 12 years, do you know how many Heisman winners were quarterbacks? The answer is ten and the other two were running backs Derrick Henry (2015) and Mark Ingram (2009). So, I think the answer would have to be a quarterback, right? Let’s face it, Will Grier is no dark horse in this race so we can exclude him from the conversation. After Grier, Charlie Brewer is the next best quarterback but with Baylor in rebuilding mode, five or six wins won’t cut it. I know it sounds crazy, but the answer could be Texas QB Sam Ehlinger. If he progresses this season with his accuracy and decision making, he could be in for a big sophomore year. 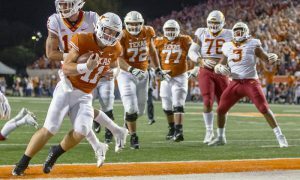 I have Texas as the second or third best team in the Big 12 right now and If that sticks (Combined with a solid year from Sam), you could make a case for him. But as of now, I must see it first. Other guys to watch are RBs Justice Hill (OSU), Rodney Anderson (OU) and David Montgomery (ISU). I have a hard time seeing anyone of these guys win unless someone rushes for 1,600 yards and their team is competing for at the very least a conference title. @Cullen_B12C asks: Why do you hate Oklahoma State football? Duke: Sorry Cullen, I was saving this one for a slow mailbag and have kept this one in my back pocket. 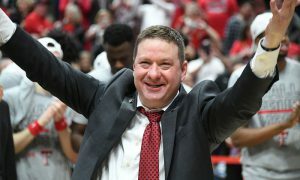 Here is the deal, I just finished up an article about the best and worst-case scenarios for Oklahoma State this season. The ceiling for me is 8-5 and the floor would be 5-7. I just don’t see the wins like some folks do on the schedule. Either Dru Brown or true freshman Spencer Sanders is going to be the guy. While I like Sanders a lot, is he ready and how good can he be as a true freshman? Dru Brown has experience but this isn’t Hawaii. Now, Justice Hill is a STUD and will most likely lead the Big 12 in rushing once again and could possibly put up some insane numbers like 1,500 yards or something. Could the offense be fine? I think so depending on the quarterback but replacing Mason Rudolph and James Washington along with some key pieces up front will be no easy task and I am sure Mike Gundy is already losing some sleep at night. Defensively is where I start scratching my head a bit. The defensive line should be fine depth and I really like LB Calvin Bundage to break out and become a household name but that secondary needs some serious work. Insert new DC Jim Knowles busting out the 4-2-5 defense and I am not sure how quickly we will see results on that side of the ball. 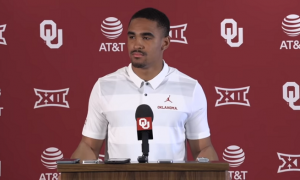 The quarterback and secondary are my two biggest issues with this team this year and those are CRUCIAL in the Big 12. I’ll say the Cowboys go 6-6 or 7-5 this season.